"I know how daunting it can be to start a church search! 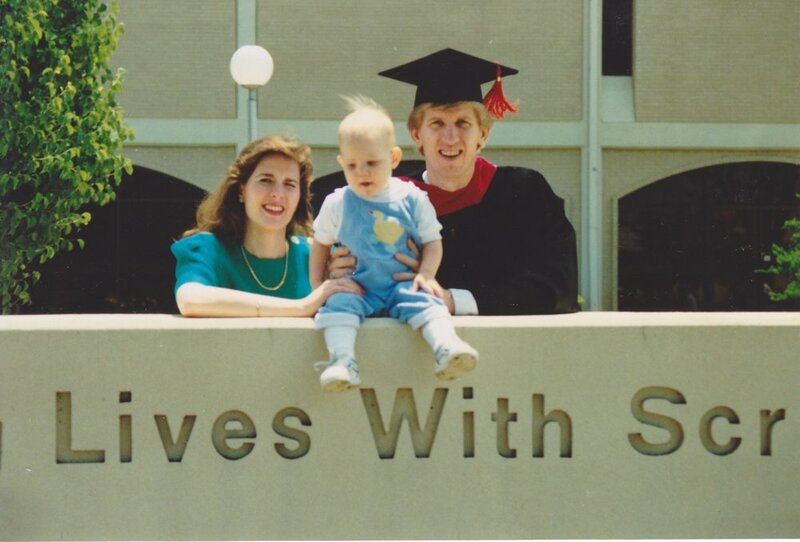 After graduating from Dallas Theological Seminary almost 30 years ago, Gayle and I moved to North Carolina with the desire to lead a faith community that would engage the mind and encourage the heart. A place where grace and truth were treasured. One that would be characterized by love, learning, and laughter. It has been an awesome adventure with no regrets! Join us this Sunday for a touch of Sunrise, and if there's anything that I can do to help you find a good church fit, please ask." Left to Right: 1987 taking a break from seminary (yes, the horse is real! ); Graduation day at DTS. Five weeks later we would set out for North Carolina; 26 years later holding our grandson; at the Jordan River where Jesus was baptized; at home with family for Christmas 2017; A church member just gave me a ticket to the 2014 US Open Golf Championship.